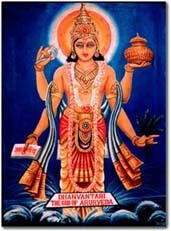 In the Vedas, Purans and many other ancient books of great knowledge, it is written that Dhanwantari is the God of Ayurveda. According to Shrimad Bhagwad, Dhanwantari with a pitcher on his shoulder represents the art of healing and is worshipped as a God and considered as the greatest of all the great physicians. "Ayurveda is the science which treats what is advantageous and what is harmful for the body and also the happy and unhappy state of life. It describes what is good and what is not good for life, it's measurement and other related matters." The Sanskrit word ayur means duration of life. The verbal root of veda means knowledge. Thus, the word Ayurveda refers to the science of the duration of life, better known as health science. This science, as presented in ancient Sanskrit texts, has been passed down through the ages and is still very relevant to human society today.